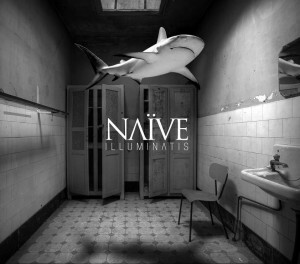 Naïve are a French band from Toulouse. The three member band describe themselves as "Trip-hop metal" - a fairly strange description I'm sure you'll agree. A better description is that they combine Metal, electro and trip-hop (downtempo electronic music). it's a fairly unusual range of genres to merge together, but it's what Naïve have done. It's a really interesting sound that has been created here - at times you've got a laid back gentle melody with soft vocals and fairly prominent electronic sounds (on "Focus" for instance), but then you also have heavier guitar-driven sections with more agressive strident vocals (e.g. on the track "Belly"). "Luna Militis" is probably one of the most effective tracks as it combines both of the bands sounds into one song - the previous songs had given the album a more schizophrenic feel with songs that really didn't seem to belong on the same album, but this ties things together a lot better. It's a very good album - one that's very hard to describe and categorize, but one that's very listenable. It's an album that will probably appeal to fans of metal who also listen to other types of music. If you only like rock and metal then this album probably isnt for you, but if you like other genres too then its definitely well worth a listen.